His Holiness the Dalai Lama provides a somewhat different perspective on the relationship of Buddhism and science than Dr. Donald Lopez, whose book was the subject of our last post. This excerpt is from the chapter "Emptiness, Relativity, and Quantum Physics" (page 64-69) from His Holiness’ book, THE UNIVERSE IN A SINGLE ATOM: THE CONVERGENCE OF SCIENCE AND SPIRITUALITY. The Buddhist concept of dependent origination posits that all entities are “empty”---or lack independent existence at the deepest level---yet our usual, practical understanding of reality also has its place. He suggests that the “two truths” view developed by ancient Buddhist philosophers can serve as a possible model for the duality suggested by contemporary physics. Quantum mechanics points to a “profound interconnectedness at the heart of physics,” nonetheless objects have individual existence at the macroscopic level. The excerpt is reprinted with permission of the office of His Holiness. In physics, the deeply interdependent nature of reality has been brought into sharp focus by the so-called EPR paradox - named after its creators, Albert Einstein, Boris Podolsky, and Nathan Rosen - which was originally formulated to challenge quantum mechanics. Say a pair of particles is created and then separates, moving away from each other in opposite directions - perhaps to greatly distant locations, for example, Dharamsala, where I live, and say, New York. One of the properties of this pair of particles is that their spin must be in opposite directions-so that one is measured as "up" and the other will be found to be "down." According to quantum mechanics, the correlation of measurements (for example, when one is up, then the other is down) must exist even though the individual attributes are not determined until the experimenters measure one of the particles, let us say in New York. At that point, the one in New York will acquire a value-let us say up-in which case the other particle must simultaneously become down. These determinations of up and down are instantaneous, even for the particle at Dharamsala, which has not itself been measured. Despite their separation, the two particles appear as an entangled entity. There seems, according to quantum mechanics, to be a startling and profound interconnectedness at the heart of physics. 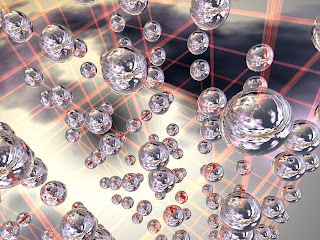 Another significant set of issues in quantum mechanics concerns the question of measurement. I gather that, in fact, there is an entire area of research dedicated to this matter. Many scientists say that the act of measurement causes the "collapse" of either the wave or the particle function, depending upon the system of measurement used in the experiment; only upon measurement does the potential become actual. Yet we live in a world of everyday objects. So the question is, How, from the point of view of physics, do we reconcile our commonsense notions of an everyday world of objects and their properties on the one hand and the bizarre world of quantum mechanics on the other? Can these two perspectives be reconciled at all? Are we condemned to live with what is apparently a schizophrenic view of the world? It is true that Emptiness or nothingNess is actually not nothing but something substantial which could not be experienced through anything else but itself. The Unmanifested. We have seen only 2 philosophies , the Buddhist even most understanding of Hindhuist philosphies treat only the Unmanifested and the manifested world as a play basically they have not defined how it sprung. On the other side ,physics have only treated the manifested world until now and slowly moving to unmanifested level by level. We need a comprehensive theory which bridges the Unmanifested and the manifested and divine universal rules from which how these two seemingly apparent things opearate. Buddhist theory of Emptiness proves nothing about relationship of physics and spiritual in terms of another but reflects the deep paradox about the dual nature of the world.